This appealing bungalow lies in a lovely position a few minutes walk from excellent village amenities and glorious countryside. The well proportioned, cared for and expanded three bedroom accommodation requires some updating and includes a fine 19' reception room and superb Philip Whear conservatory, all set within an established corner plot and garden with garage, good off road parking space and valley views. THE LOCATION Constantine is a thriving and popular village with an active community and great everyday facilities which include a well-regarded primary school, historic C of E Church, two village stores, one specialising in wine and spirits, a bakers, together with two village pubs - The Queens Arms and the excellent nearby Trengilly Wartha Inn and Bowling Green is very convenient for the Doctor's surgery and dispensary. The village is a sociable place too, with numerous societies and clubs and an increasingly popular community hall called The Tolmen Centre offering a variety of events. The village is rural and unspoilt, lying within easy reach of Port Navas creek as well as being on a daily bus route to Falmouth Harbour and Helston Market towns (approximately 6 miles each). Bowling Green is a particularly popular area of Constantine lying a few minutes' walk from the village centre and glorious rural walks down towards Port Navas creek. THE PROPERTY St Julians was built in 1967 and has been its current owners happy home for over 50 years. Their advancing age has necessitated a move to live with family in Cornwall. Over the years the bungalow has been expanded to provide a third double bedroom and most recently a superb conservatory, accessed from the lounge/dining room and where double doors lead a large sheltered terrace and the south facing garden. The bungalow does require some modernisation but has been well cared for and benefits from UPVC double glazed window and an oil fired boiler fuelling radiator central heating and providing hot water. The established garden is full of life and colour with fruit trees and a produce area, together with off road parking and space for a caravan, boat or motorhome, perhaps. All in all, a great opportunity to own and personalise an appealing village home in this lovely location - thoroughly recommended! KITCHEN 14' x 8' (4.27m x 2.44m) UPVC double glazed window and a glazed panel door and side pane to front. Fitted base and wall units with roll top work surface and inset one and a half bowl sink and drainer with mixer tap. Shelved larder cupboard. Space for cooker, fridge/freezer and tumble dryer. Space and plumbing for washing machine. Radiator. LOUNGE/DINING ROOM 19' 10" x 12' (6.05m x 3.66m) A generous size with UPVC double glazed windows to front and side and wide sliding UPVC double glazed door leading into the conservatory at the rear. Open fire place with tile surround and hearth. Built-in cupboards and shelves to side. Two radiators. Electric night storage heater. TV and power points. CONSERVATORY 15' x 11' 5" (4.57m x 3.48m) A superb 'Philip Whear' room projecting into the garden and with views through to valley and countryside. Cavity block built base wall with UPVC double glazed windows and an apex roof with lights and fan. Twin UPVC double glazed doors onto the terrace and garden. BATHROOM In white with wash hand basin and metal panel bath with 'Mira' electric shower over. Radiator. UPVC obscure double glazed window to front. SEPARATE WC In white. Obscure UPVC double glazed window to side. BEDROOM ONE 13' 10" x 10' 3" (4.22m x 3.12m) UPVC double glazed window to garden and countryside in the distance. Radiator. Power points. Built-in shelved airing cupboard with radiator. Timing controls. BEDROOM TWO 12' 7" x 12' (3.84m x 3.66m) UPVC double glazed windows to two aspects overlooking the rear garden and to woods and countryside in the distance. Radiator. Chest of drawers. Telephone point. GARAGE 17' 6" x 8' 11" (5.33m x 2.72m) Window, up and over metal door. Electric meter and trip switches, power and light. Internal water tap. 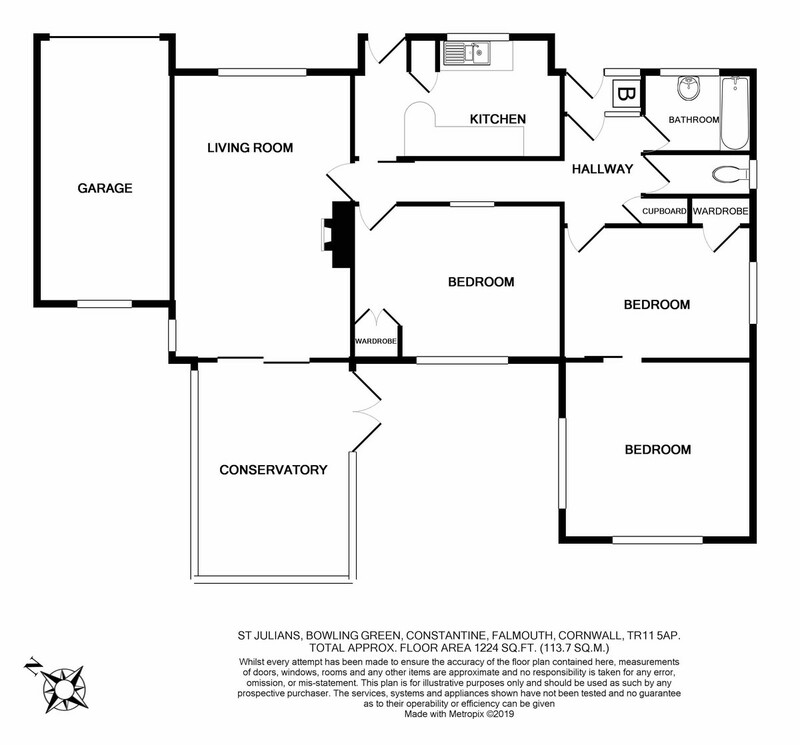 OUTSIDE St Julians occupies a good sized and relatively level corner plot with nicely established gardens. A gate and twin posts lead from the road onto a driveway to the garage, with additional parking space beside for a caravan, motorhome or boat where removeable posts allow ease of access. External power points. FRONT Part of the front garden is lawned with a stepping stone path, a front Cornish hedge and mature borders including pierus, azalea, rosemary, camellia and hydrangea and a healthy climbing clematis. Triangular bed with azaleas and roses. To the front of the property is a bed containing forsythia and climbing jasmine. External lights and power point. Side access with path, fuel bunker and oil tank. TIMBER SHED 7' x 5' (2.13m x 1.52m) Recently bought and tanalised: in excellent condition.